Young twigs villous, later glabrate; lvs broadly ovate to deltoid, 0.5-5 cm long and often as wide or wider, deeply and laciniately lobed, the lobes coarsely toothed or again cleft near the tip, villous above and thickly gray-pubescent beneath when young, glabrous or nearly so at maturity; petiole villous when young, often equaling or longer than the blade; fls 1-1.2 cm wide, in villous compound cymes; fr 4-8 mm thick; plants otherwise much like no. 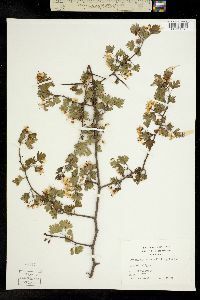 2 [Crataegus spathulata Michx.]. S. Va. to Fla. and Tex., n. in the Mississippi Valley to se. Mo. and s. Ill.